How funny is this candy? 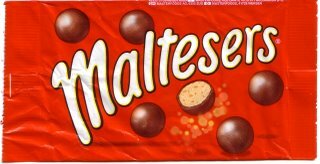 How great would it be to get a photo of me eating Maltesers in Malta? Can you say DORK? If anyone ever sees these please buy me some. 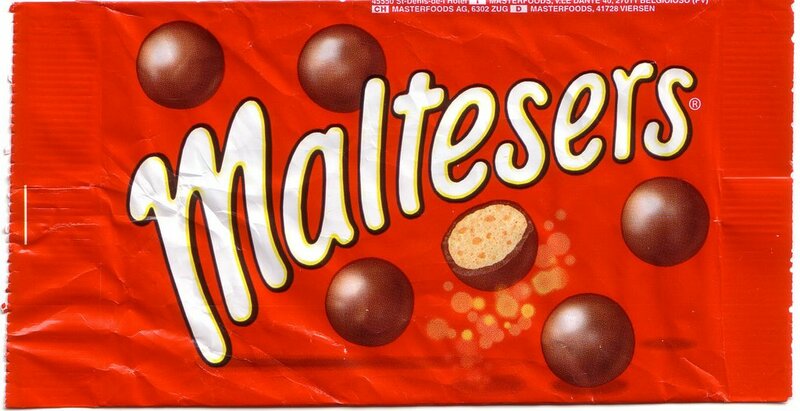 I know, I am Maltese obsessed right now - although these are a British/Australian candy. Interesting, I looked up the meaning of Maltese Cat since I knew it was not a breed of cat, however it is a breed of dog. The name Maltese cat is often given to any solid grey or blue cat of inderminate breed. There are several cat breeds that are always blue. 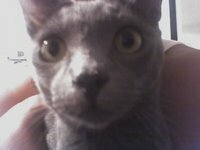 These are the Russian Blue, the Chartreux and the Korat. In literature, "The Maltese Cat" is the title of a short story by Rudyard Kipling. The story is about a polo match set in British Colonial India, told from the point of view of one of the ponies, a gray named The Maltese Cat. I didn't want to give too much away yesterday with my cryptic message about taking yourself out of your comfort zone, letting your inner child out, etc. because I didn't want to jinx myself. Yesterday I had my first horseback riding lesson and it was incredible. I had to overcome a fear that I had of horses. I am not sure where it came from or when it really started. I had gone riding while in high school for fun and was fine but over the last couple years whenever I was around the majestic animals, I was scared. I went to hypnotherapy and got over my fear. I actually found out it wasn't the horse at all, it was me and my lack of self confidence. So, yesterday was a REALLY big day for me. I actually went in an area at the stables that was fenced off but contained about 30 horses and I was fine. I got a horse named Snickers and brushed him, cleaned his feet (hooves/frog), learned to put on the saddle and bridle and had a great lesson. The kicker is, I originally wanted to learn Western riding but my instructor talked me into English and I loved it. I learned how to get Snickers to go where I wanted, did some work in the ring going in and out of cones, did some figure eights and then trotting! 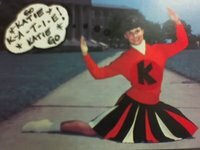 I learned to trot and then did rising trot. I got it right off the bat too! After my lesson, I took the saddle off and fed Snickers 2 carrots and wasn't scared to put my hands near his mouth. I have say that I am proud of myself as lame as that sounds. This was a huge move for me and I am proof that you can overcome your fears. PS - Thanks W, for the card pictured here! Thanks to all of my personal cheerleaders who supported me with this, it means so much! Though I am not a huge chocolate lover, I do love it with peanut butter. Try this smoothie next time you are having a craving. Let it rip in the blender for about 3 minutes on high until there are not any ice chunks and it is nice and thick. Like a real milk shake but NOT! It is never too late to do the things you always wanted to do as a child. Let your inner child out and let her/him appear often in your adult life. Too often we let the thing that sits between our ears inside our skull get in the way. Follow your heart, it is OK to ignore your brain sometimes. I do think there is something exhilarating about taking yourself out of your comfort zone. Change can only come from one person...YOU! I want to tell you all about a great discovery I made yesterday at Whole Foods Market. It's a cool little spork you can use instead of using plastic utensils when regular silverware is not available. It is only $1.99 and made by company called bambu. There is a fork on one side and a spoon on the other. I have used it at lunch 2 days in a row now and think it is fabulous. I need to get another one to keep in my purse. 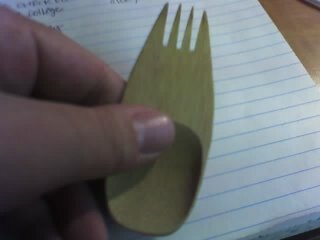 You know, most plastic ware is not recyclable so this little thing helps out with plastic waste. Make a change today! Just trying out this blog thing to see if it will help keep everyone abreast of the wild world of Katie. I hope that you find some of this interesting, silly and maybe a waste of your time as well. My plan is to add anything I want to share with you all on here whether it is a great restaurant I went to, a good recipe, craft idea, etc. Feel free to post comments, I am still in the process of adding you all to my members list. This is private and can only be viewed by the "inner circle".